O.N.E. 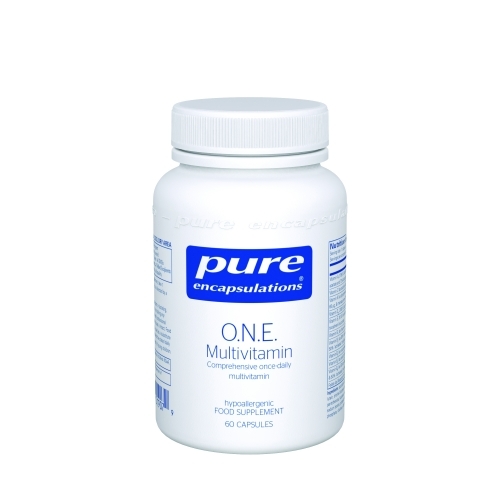 Multivitamin is a once-daily formula with a comprehensive profile of highly bioavailable vitamins, minerals and phytonutrients and other factors to support optimal nutrition for both men and women. 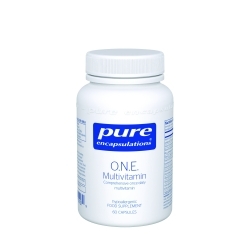 Provides vitamins A, B, C, D, E and K in highly bioavailable forms. With active forms of B vitamins including folate as 5-methyltetrahydrofolate (5-MTHF), the universally metabolized and biologically active form of folate. Provides 2000 IU of vitamin D3 in each vegetarian capsule. Features sustained-release water-soluble CoQ10 as well as the carotenoids lycopene, lutein and zeaxanthin for greater daily nutritional support. Expertly formulated to provide optimal levels of each nutrient.